The F 583-4 is the ultimate small stream toy. 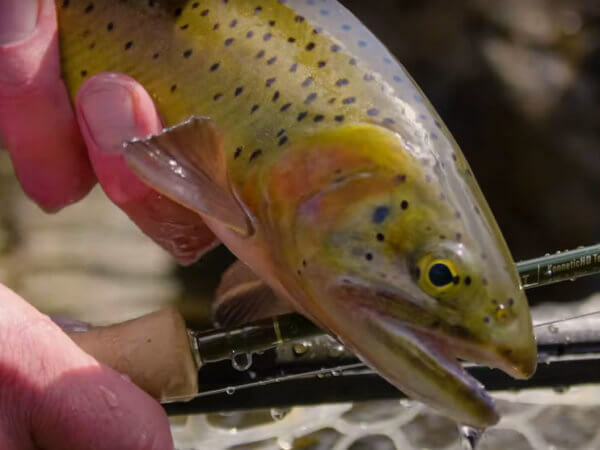 Unlike sub-6′ rods of the past, the F 583-4 actually casts like a regular fly rod, loading and unloading gracefully, flexing almost to the cork, but producing tidy casting loops for accurate presentations in tight quarters. Being the only Telluride Angler staff member who is shorter than this rod, I had reason to dislike it from the beginning. “The Wee One,” however is indisputably a house favorite. We fished an advanced prototype of this model all spring on the creek tributaries of the Dolores and San Miguel. Ultra-short rods work well in tight quarters, but most don’t “cast” a fly line in the conventional sense. Thanks to its highly refined taper, the F 583-4 flexes evenly and casts with a normal casting stroke. The rod bends almost to the cork but forms nice casting loops from 10’-30’. It will actually cast much farther, but the angler has limited ability to mend line or set the hook beyond 30’. Playing fish with it makes me giggle, but the leverage provided by this short rod allows the angler to dictate the fight with surprising command. This is my favorite kind of toy. Fly lines: Choose a line that is true to line weight, whether weight forward or double taper. My favorites include the SA Trout Taper WF3, SA & Rio Double Taper lines and the Rio Perception. This little thing is a show stopper! It is too much fun to cast and to fish. We’ve been passing a prototype of this rod around the shop, and it sure is a bunch of fun. I was excited to see the finished models at IFTD. This rod actually turned out to be very similar to the prototype in the end. The finished model was smoother, more stable and had the same ability to zip tight loops through a tunnel. Fish an SA Mastery Trout DT3F or a Rio Gold on this rod. Both are great, but I actually liked the way the DT casts better. This little rod loads up wonderfully in close and has a pleasant but crisp action. Springy in the cast, but nicely damp and no wobble in the tip at all. You might think this is a graphite rod. This little dude can throw some line too, if that’s your thing with a 5’8” 3-weight. The rod wants to fish in close, crawl under the bushes and interfere with a creek dwelling fish near you. So much fun, so small, such a tiny pack length, but it is every bit a serious purpose-driven fly rod. It has a slide band too. Some customers don’t like them, but I think they’re really cool.